This entry was posted in articles, Papers, Presentations, etc., presentations, Results and tagged Alex Fine, Austin Frank, Benjamin Van Durme, confusability, entropy, Esteban Buz, hyperarticulation, Ian McGraw, lexical production, online speech recording, self-paced reading, sentence processing, surprisal, Tal Linzen. Join me at the 15th Texas Linguistic Society conference? I’ll be giving a plenary presentation at the 15th Texas Linguistic Society conference to be held in October in Austin, TX. Philippe Schlenker from NYU and David Beaver from Austin will be giving plenaries, too. The special session will be on the “importance of experimental evidence in theories of syntax and semantics, and focus on research that highlights the unique advantages of the experimental environment, as opposed to other sources of data” (from their website). Submit an abstract before May 1st and I see you there. This entry was posted in For students, presentations and tagged TLS14. A few days ago, I presented at the Gradience in Grammar workshop organized by Joan Bresnan, Dan Lassiter , and Annie Zaenen at Stanford’s CSLI (1/17-18). The discussion and audience reactions (incl. lack of reaction in some parts of the audience) prompted a few thoughts/questions about Gradience, Grammar, and to what extent the meaning of generative has survived in the modern day generative grammar. I decided to break this up into two posts. This summarizes the workshop – thanks to Annie, Dan, and Joan for putting this together! For most linguists it is now clear that most, if not all, grammaticality judgments are graded. 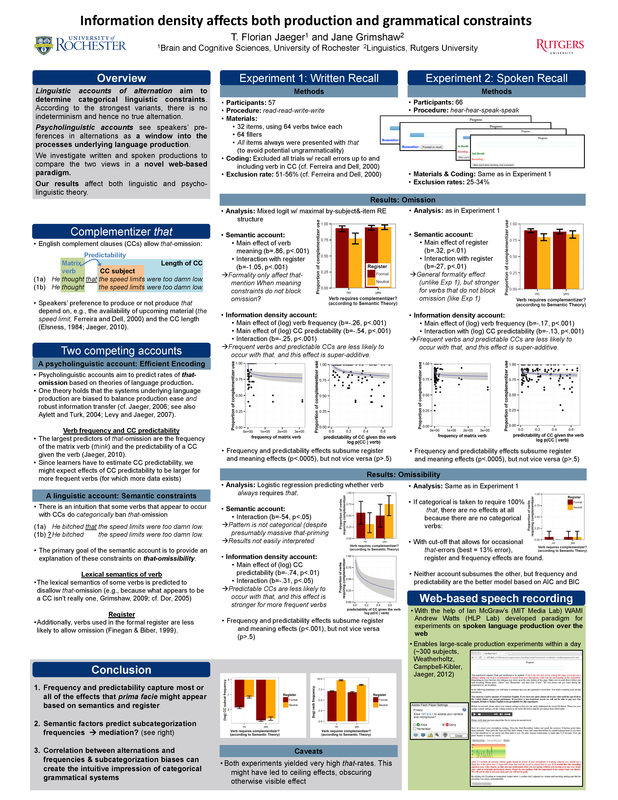 This insight is leading to a renewed interest in implicit knowledge of “soft” grammatical constraints and generalizations from statistical learning and in probabilistic or variable models of grammar, such as probabilistic or exemplar-based grammars. This workshop aims to stimulate discussion of the empirical techniques and linguistic models that gradience in grammar calls for, by bringing internationally known speakers representing various perspectives on the cognitive science of grammar from linguistics, psychology, and computation. This entry was posted in HLP lab, presentations, summaries and reviews, workshop and tagged adaptation, Baayen, Bosch, CSLI, distributional learning, Farmer, Fine, Gibson, gradience, gradience in grammar, gradience2014, grammar, Jaeger, Kleinschmidt, linguistic knowledge, linguistic representations, MacDonald, noisy channel, Piantadosi, Stanford.